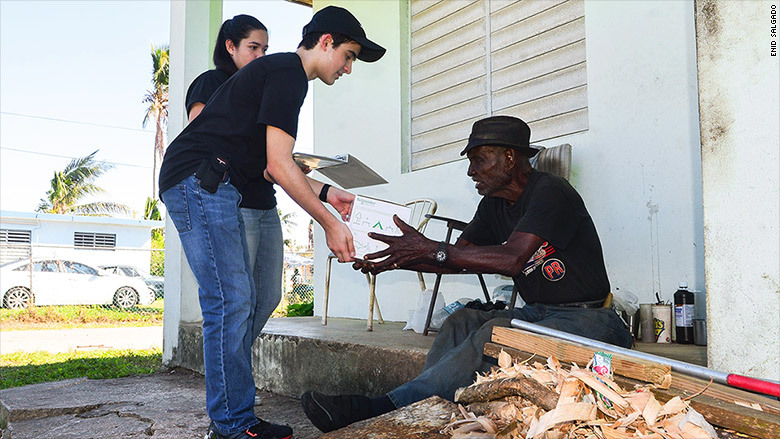 More than four months after Hurricane Maria ravaged Puerto Rico, 15-year-old Salvador Gomez Colon is shocked by the poor living conditions that persist in many of the towns throughout the island. "There is so much need," said Gomez Colon. "People are still shoveling debris around their homes. With no power, the elderly are struggling with the heat." Nearly half a million of Puerto Rico's residents still don't have power. Families are living in houses with makeshift roofs made out of tarps and other materials and roads and bridges remain badly damaged. "The farther you go from the metro areas is where you really see it," said Gomez Colon, who lives with his family in San Juan. "It's very crazy to think that there are still people without power," he said on CNN on Saturday. "Four months without power is an extremely traumatizing experience." 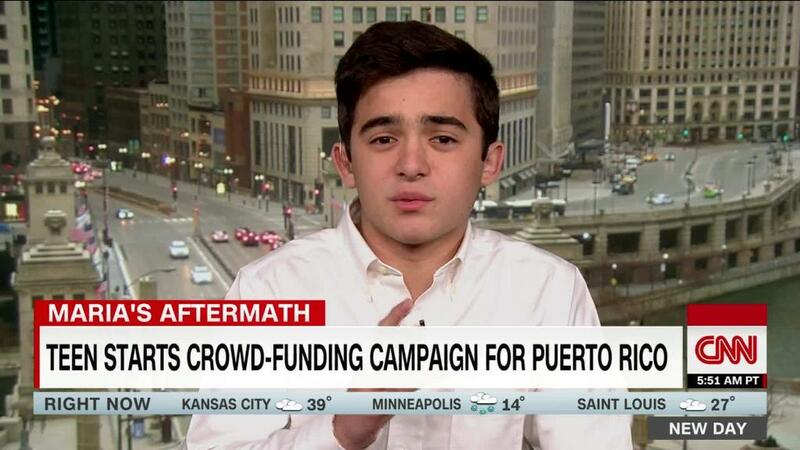 Just days after Maria slammed Puerto Rico, the ninth grader launched a crowdfunding campaign on fundraising platform Generosity. His goal: to raise $100,000 and use the money to buy portable lamps and hand-operated washing machines for residents in the hardest hit parts of Puerto Rico. Since that time, Gomez Colon has raised more than $125,000 and has donated 1,400 solar lamps to some 840 households. He has another 1,600 lamps that he hopes to distribute soon. With the help of his family, friends and other volunteers, Gomez Colon started distributing the solar lamps last November through his initiative C+Feel = Hope. "When we went to the first town that has no power, people from other towns would hear what we were doing. So we would add that town to our list for our next distribution," he said. 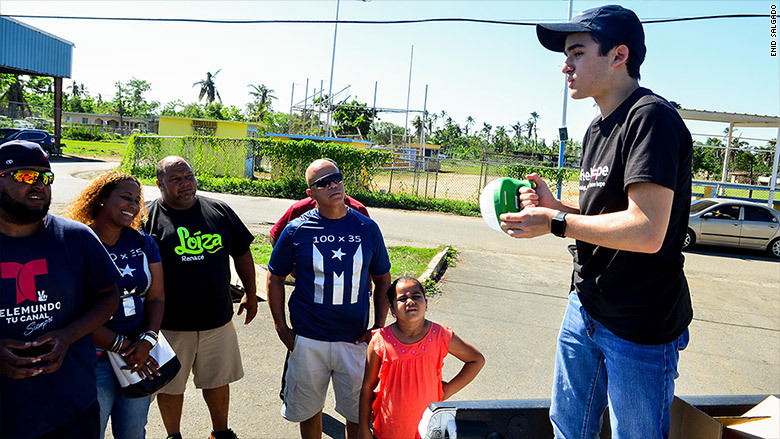 Salvador Gomez Colon, 15, used crowdfunding to buy solar lamps for families living without power in Puerto Rico. The teenager visits these communities on the weekends. He's seen schoolkids studying in the hot sun, rushing to finish their homework before the daylight disappears. In one town, Gomez Colon met a young woman sitting outside reading Homer's Illiad. "She told me she couldn't read at night because there's no light," he said. So he handed her a portable solar lamp. "I told her she didn't have to worry about rushing through the book in the heat," he said. "For the first time in three months, she was going to be able to read it at night." CNNMoney first interviewed Gomez Colon in the immediate aftermath of Hurricane Maria in September. At the time, he was hunkered down with his family in their San Juan apartment. The family was rationing the food and water they had stored before the storm hit. Still, the teenager knew he was better off than many others on the island. With his mother's help, he sought a nonprofit organization to partner with and launched his online campaign. Gomez Colon has already distributed more than 1,400 portable solar lamps. As the money came in, Gomez Colon contacted makers of portable solar lamps and washing machines. To date, he's secured close to 300 hand-powered washing machines from companies like Gentlewasher and EasyGo and more than 3,000 lamps -- including some that have mobile phone charging capabilities -- from Mpowerd, Schneider Electric and Omnivoltaic Energy Solutions, among other companies. 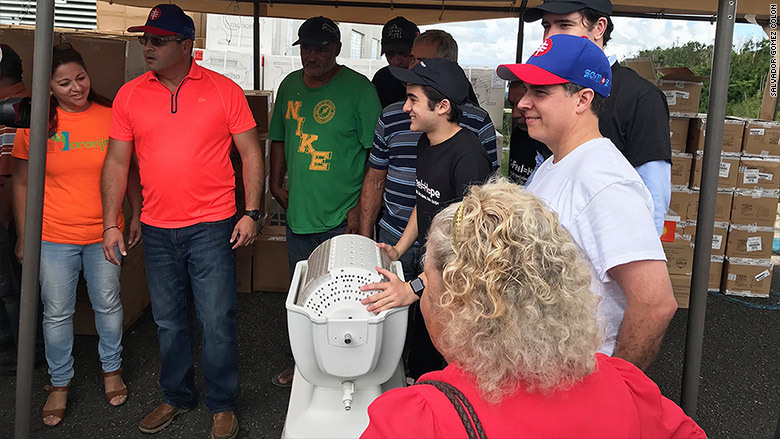 Last week, he led the first distribution of the hand-operated washing machines to families in Naranjito, a town located in central Puerto Rico. "Every weekend that we've gone for a distribution has made me feel so good," he said. "But it's complicated. We are helping people, but there are just so many others also in need." In January, Gomex Colon also started distributing portable, hand-operated washing machines. According to the most recent tally from Puerto Rico's government, about 80% of the island has had power restored, 96% has access to running water and almost 98% now has telecom services. The Federal Emergency Management Agency said it was halting new shipments of food and water to the island as of Wednesday, an agency official with direct knowledge of the plan told CNN. In a statement, the agency said that "FEMA-provided commodities are no longer needed for emergency operations." The agency also noted it has more than 46 million liters of water, two million Meals Ready to Eat and two million snack packs on the ground in Puerto Rico ready for distribution if needed. Gomez Colon said he will keep distributing solar lamps until the money runs out or until people no longer need them. Still, hundreds of thousands of residents remain in the dark, according to Puerto Rico Electric Power Authority. Loubriel Vega, 34, a fire inspector with the fire department in San Juan, is one of them. He lives with his three young children in Morovis, a town 38 miles outside of San Juan. The family has running water, but has not had power, Internet or consistent cellphone service since September. Hurricane Maria also badly damaged the roof of his house. Vega received two solar lamps through Gomez Colon's effort. He said the lamps have been immensely helpful for simple things like cooking and helping his kids and disabled family members move around the house at night. "We need power badly," he said. "Without it, how do we run our fridges and freezers and keep our food safe?" Gomez Colon said he will keep going until either the money runs out or people no longer need the lamps and washing machines. People can still contribute to the campaign, he added. "This experience has taught me to be grateful for what I have. My family supports me, my teachers support me," he said. "The world can always benefit from a positive mission. So I have to take this to the end."